Beautiful Original Painting on Canvas "Sienna Square from Chiasso del Barcello"...............BY THE FABULOUS ARTIST DAVID ALDUS. 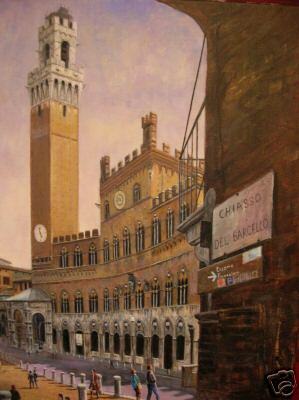 Painted in beautiful Sienna, Tuscany. (Highest price received for one of his paintings is £14,000 !! "Lot's Wife" Absolute investment opportunity! ) Measurements height 24 inches by 18 inches. Oil on Canvas. .